cityadministrator@oaklandnet.com, atlarge@oaklandnet.com, officeofthemayor@oaklandnet.com, SPiper@oaklandnet.com, jbrunner@oaklandnet.com, zwald@oaklandnet.com, pkernighan@oaklandnet.com, nnadel@oaklandnet.com, tjackson@oaklandnet.com, lschaaf@oaklandnet.com, idelafuente@oaklandnet.com, dbrooks@oaklandnet.com, "lreid@oaklandnet.com"
"not something we usually report on but no one else will." - much respect. Atlanta police have declared media reporting at #OccupyAtlanta to be unlawful. Demand freedom of the press. Google asked by US law enforcement agency to sanitize videos exposing police brutality from You Tube, claiming they "defame law officers." My livestream filming guy got gassed. He's not doing too good right now. Poor dude. this is USA democracy? you were a light in the dark. what a shame! 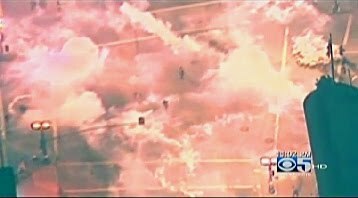 Flash-bangs are a type of hand grenade, being used on non-violent US citizens for "illegal assembly." Not rioting; not criminal acts. Police used teargas and smoke grenades and rubber bullets on a camp with children in it. 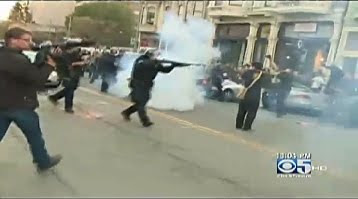 I don't recall gun-totin Tea Partiers being tear gassed for their peaceful protests. Banks got bailed out, we got tear gassed. I wonder what officers say to cops to make them feel it's OK to act like animals. Audio will surface, bet on it. State Sen. Vincent Fort (D-GA) arrested. why are police arresting and using military-grade weapons on peaceful protestors across the country? You really shouldn't download these videos; it's against TOS. Grenade deliberately thrown into crowd of people, not street trying to aid Scott Olsen, a Marine veteran of two tours of Iraq, already down and bleeding, who gets it right next to his head. Sickening. UPDATE: as of Wednesday he is in Critical condition. No violence; marching, standing; "unlawful assembly"
This woman's batteries ran out in her wheelchair, stranding her in clouds of tear gas. Three protesters braved the gas to rescure her; lifting her chair and running with it. He's joined by an Iraq vet - two men of great honor; I salute you. CS grenade #2 and remains of flash-bang? 2003 news clipping regarding lawsuit and Oakland police banning the use of the weapons ther are using now.